Wait, that's a variant of argument from authority. You are doing well. Keep it up! Also, it seems it was warmer 1000 years ago than it was now. The warning of "but evolution won't be able to keep up" doesn't make much sense. (1537) "Now look at the end of xkcd's plot, where more errors are found. Start around Anno Domini 1900. By that time, thermometers are on the scene, meaning that new kinds of models to form global averages are being used. These also require uncertainty bounds, which aren't shown. 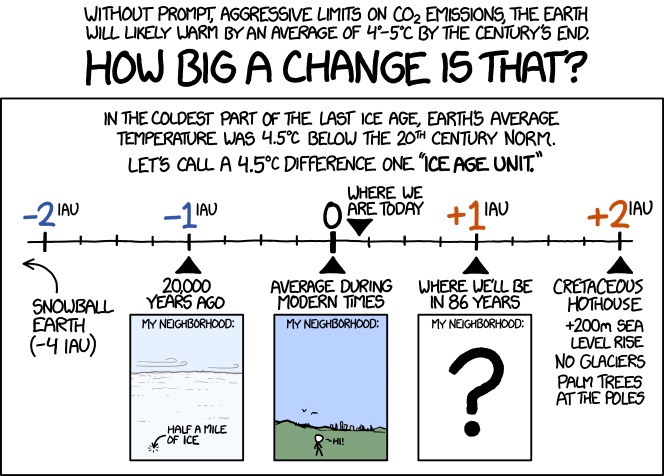 Anyway, xkcd, like climatologists, stitches all these disparate data sources and models together as if the series is homogeneous through time, which it isn't. Here's point (3): Because we can measure temperature in known years now (and not then), and we need not rely on proxies, the recent line looks sharper and thus tends to appear to bounce around more. It still requires fuzz, some idea of uncertainty, which isn't present, but this fuzz is much less than for times historical. The effect is like looking at foot tracks on a beach. Close by, the steps appear to be wandering vividly this way or that, but if you peer at them into the distance they appear to straighten into a line. Yet if you were to go to the distant spot, you'd notice the path was just as jagged. Call our misperceptions of time series on which xkcd relies for his joke statistical foreshortening. This is an enormous and almost always unrecognized problem in judging uncertainty." Again, we don't know. We have never been able to calculate a global temperature. (1537) Yes, but if one still believed that the data could show anything, these graphs would be difficult to deal with. Yes, but if one still believed that the data could show anything, these graphs would be difficult to deal with. Since that is the idea, that point does indeed depend on illiteracy. Unfortunately, since most of the public is not aware of the need to validate data and the methods for doing so, and in not knowing how statistics work, many are led astray. Unfortunately, this idea works all too often. It really is impractical to make everyone expert enough in statistics to see the problem. The media are particularly bad at it. They are out to sell the news. Fantastic exciting stores are what sells. It's like the professional gossip system. Gossip has always been terribly destructive. You will come across people like this. Gossiping lets them feel important, and they often don't understand the damage they do.